Since I became a digital nomad I move places quite a lot – and even though I only travel every few months it is hard to establish healthy routines. Which is why I started looking for workouts I can do while traveling, without any equipment, anywhere and anytime. 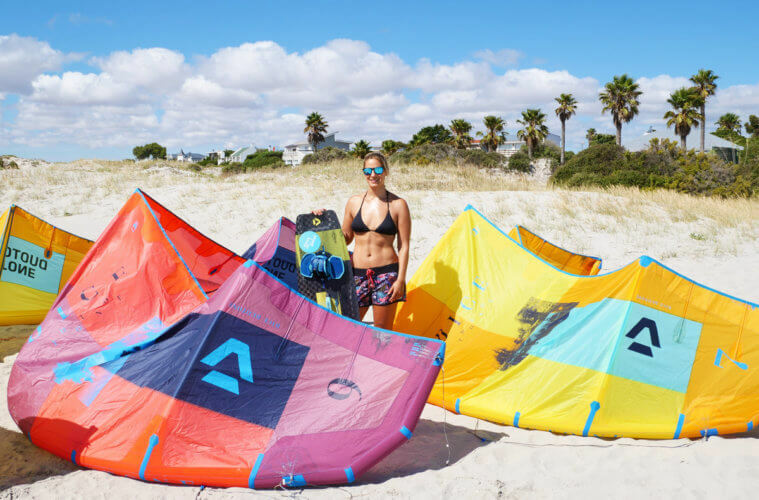 Also if I get a windless week at a kitespot it’s a good alternative to get your sweat on. Do I really need no equipment at all? These workouts are full body workouts you can do anywhere – at home, while traveling, no gym needed! All you need is you and for some exercises a mat or towel (but you could even do it on the hotel room floor if you want). You can wear workout shoes but I usually do it barefoot when I’m in a room. On a side note: some workouts are more high intensity/high impact which means they’re not made for very squeaky wooden floors haha. 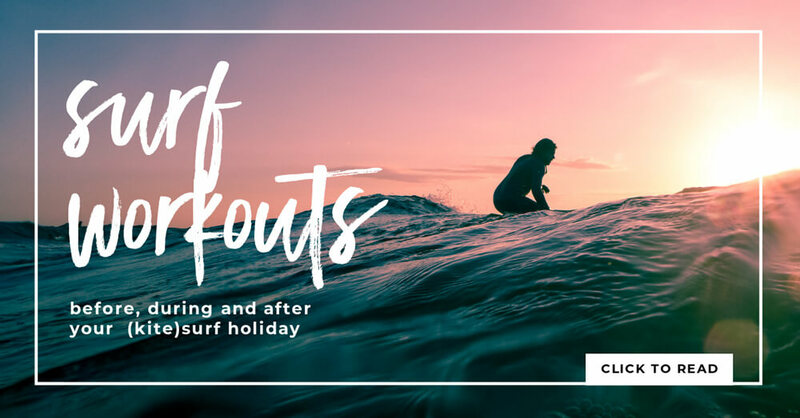 So choose depending on the hotel/apartment you’re staying in (or grab some other travelers and do it outside on the grass), if you have a squeaky floor go more for the low impact, Pilates or Barre workouts. 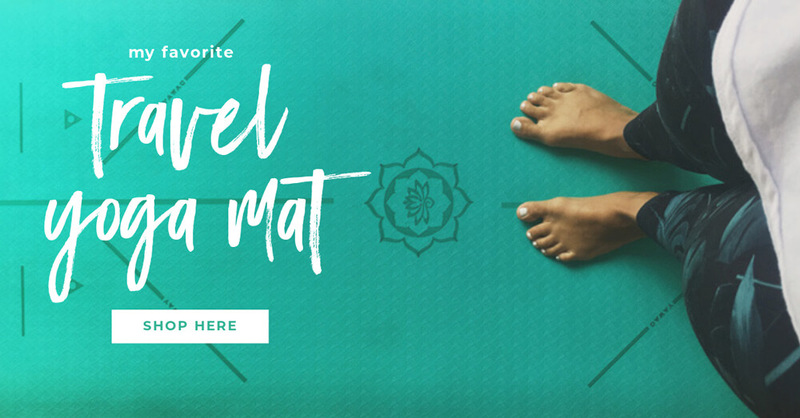 I travel with an eco-friendly yoga mat which I like to use for all the workouts since I’m usually doing them barefoot. It’s quite heavy with almost 1 kg but I love the cushioning and color (turquoise) and graphics. For some workouts you can use resistance bands (which I can highly recommend, they’re the lightest fitness equipment ever and take up no space) but you can also easily do the workouts without them. Since I never know how the wifi will be at the destination when I arrive I usually download some workouts to watch offline (which you can easily do for free with the youtube app). For more no-equipment travel workouts check out the Full Youtube list – I’m updating it every time I find a new workout. 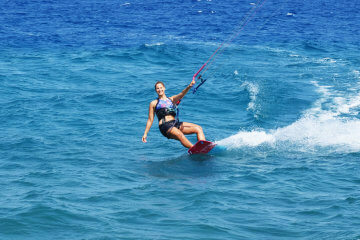 Want to get fit for your next kitesurf holiday? Then check out this post with workouts that will get you ready to hit the water even harder.